Karla Fournier, a native of Oklahoma, is currently in her 23rd season with the Arkansas Symphony Orchestra. She holds a Bachelor of Music degree and graduate study from the University of Houston, Texas. She performed in numerous orchestras in the Houston area while teaching at the River Oaks School and the Cole Music Conservatory. She also served as the music director for the Children's Theatre of Performing Arts Program. Since coming to Arkansas, Karla Fournier has served as an adjunct clarinet professor at the University of Arkansas at Little Rock and at Ouachita Baptist University in Arkadelphia. She served as the principal clarinetist with the Pine Bluff Symphony for 22 years, and second clarinetist with the Arkansas Symphony Orchestra since 1990. In addition, she has been the Director of Orchestras for the Conway Public Schools for twelve years. Her orchestras have earned top honors in Arkansas and Texas competitions. 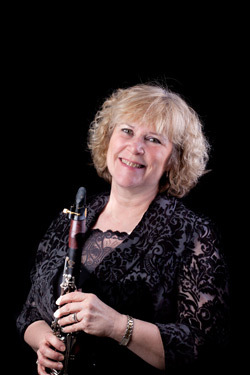 Her daughter Kinsey is currently pursuing graduate study in clarinet performance at the University of Michigan - Ann Arbor. Mrs. Fournier is married to Dr. Michael Underwood, professor of music at the University of Arkansas at Little Rock and Arkansas Symphony Orchestra principal trombonist.